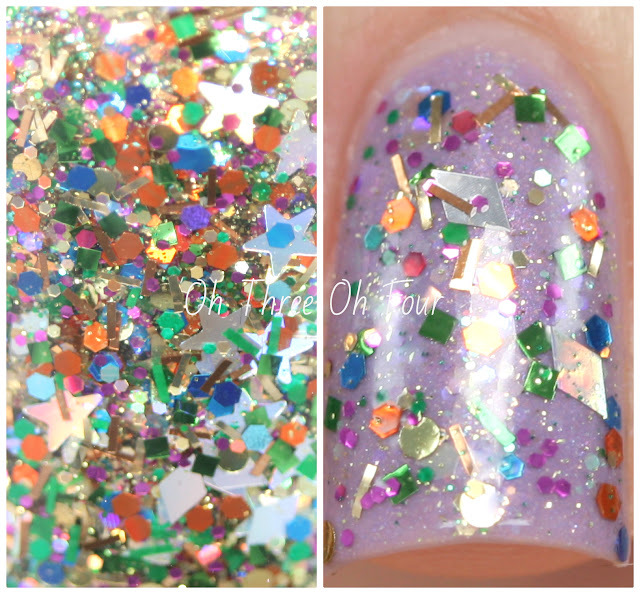 Angel Wings has a light purple base with holographic micro glitters and iridescent glitters. Shown is 3 coats with top coat. Gargle Blaster is described as a mint green shade with a slight shimmer, accented with fuchsia, silver and gunmetal glitters. All nails 3 coats with top coat. While I didn't know where the name of this polish came from before reading the listing, I think it's hilarious now! :P The fuchsia glitters work perfectly with the mint base and there is an added shimmer to the base that I didn't see in the bottle, but it really popped out at me when I put it on the nail. Holiday Cheer contains red, green, blue, orange, fuchsia and gold and silver holographic stars with bronze and copper tinsel glitters. These photos are 1 coat over 3 coats of Angel Wings. Ice Flowers is a mixture of various sized white and periwinkle blue glitters in a light wintery blue base with a hint of shimmer. Here is 3 coats with top coat. MoonJelly has a blueish green base with green, teal and gold glitters. All nails are 3 coats with top coat. The Impossible Girl is described as a a dark grey base with a mix of light grey, red and black glitters. Shown is 3 coats with top coat. Find Painted Sabotage for sale through their Etsy storefront. Make sure to follow Painted Sabotage on Facebook, Pinterest, Instagram and Twitter! Also run over to Royal Milk Tea's blog where you can enter to win a Painted Sabotage Holiday Trio, among other prizes!